The repeated caw of a lone crow cracks the frost-dried air and reverberates across the glistening meadow before disappearing into the trees. It’s a sound I don’t like, one I associate with death, but this morning its role is to herald the sun which is about to appear over the tree line and lay a feeble warmth across the landscape, like a threadbare blanket over a hypothermia victim. 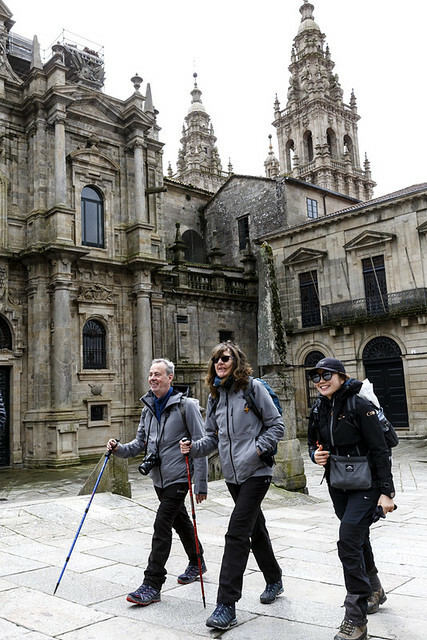 It’s the second day of our Camino Santiago experience and we’re walking from Arzúa to O Pedrouzo. 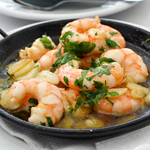 It’s a cold March morning in Galicia, the temperature barely raising its head above the parapet of its frozen night. As yet, there are few other pilgrims on the route but that will change as the day grows older. 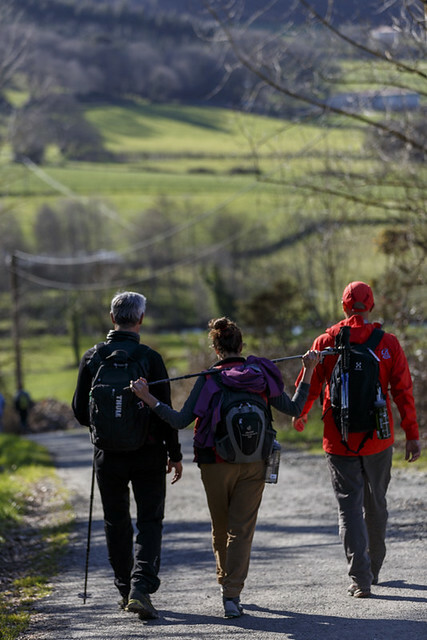 We’re walking the final stretch of the Camino Frances, the most popular route, and we are far from alone in doing so, despite being so early in the season. 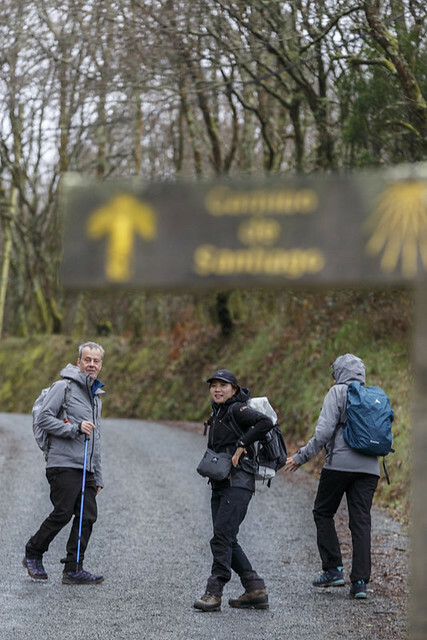 By Camino standards this is a short day, just 18km, a day for ambling, absorbing, reflecting; the sort of day this journey is all about. 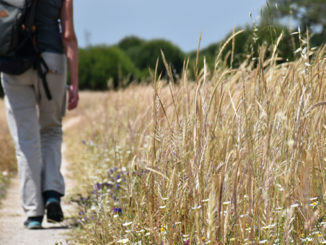 Before we left Madrid to embark on our bite-sized pilgrimage, we listened to a psychologist recount her experience of twice walking the Camino in full and how it ultimately changed her life. She spoke of the inward reflection of the journey; how it gave those who undertake it the time and space to reflect on who they are, their weaknesses and their strengths. Hearing about her experience filled me with an expectation that over the next three days, freed from the pressures and responsibilities of a busy working life, I might find myself able to think beyond the next deadline. Walking has always been my preferred route to fresh ideas and thinking outside the box. 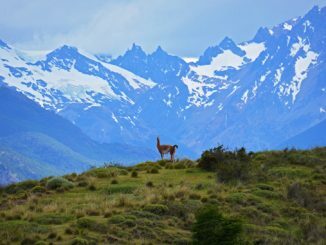 When I’m on any kind of long distance walk, my feet fall into a rhythm so my body expends physical energy unsupervised, allowing my mind to wander wherever it pleases. Sometimes my thoughts flit across frivolous meadows, at other times they venture deep into canyons before emerging into sunlight, viewing a problem or an aspect of my life with entirely new eyes. We pass the familiar stone waymark post with a yellow shell on a blue background. On top, a pair of walking boots sit, their journey done, their story now woven into the very fabric of the Camino. The path flits in and out of eucalyptus-scented woodlands; past farms where kittens lie alongside chickens, warming their heads in the morning sun; through village squares where the spouts of stone fountains trickle and wood smoke spirals from cottage chimneys. As the day progresses, we encounter more pilgrims sharing this penultimate section of their own journey – groups of teenagers on some kind of team building or outward bound event; couples, friends, the occasional lone walker – and with each, the almost compulsory buen camino greeting is exchanged in recognition of a shared yet deeply personal experience. Our final morning dawns damp and grey as we set off from O Pedrouzo. It’s the sort of weather that would normally have me postponing a walk but on the Camino that isn’t an option. Leaving the town and heading into the woods we quickly fall into our usual rhythm despite the now persistent drizzle and I remember a walk on Gran Canaria many years ago when we sat on a ridge and squeezed the rain out of our socks before continuing, our feet squelching in our sodden boots. The contrast today couldn’t be more marked – my feet are bone dry and supremely comfortable, I’m exactly the right temperature despite being zipped up to the chin and hooded – in other words, I’m free from the extraneous distractions and discomforts that negate the joy of long distance walking. 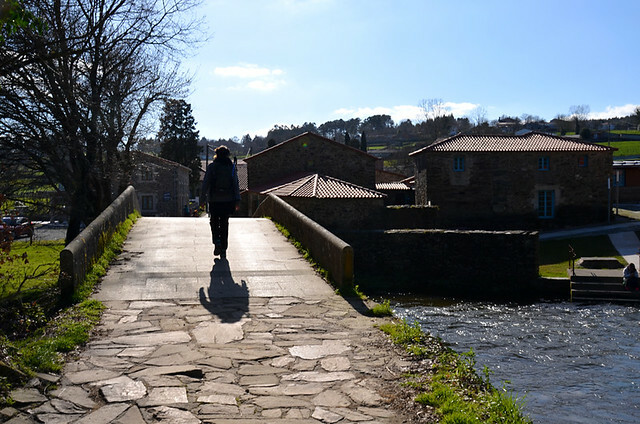 It’s mid-afternoon when we arrive at the outskirts of Santiago de Compostela after walking 21km and I begin to feel a frisson of joy as the waymarked distance to our final destination begins the countdown. By the time we arrive into the square in front of the cathedral, I feel an elation that belies the meagre 54km we have walked over the past two and a half days, a sense of camaraderie with my fellow walkers, and a pride in our earned right to be there. I can barely imagine how magnified that feeling would be if I had walked the 300+km of the Primitivo. The sun makes a fleeting appearance for our triumphal arrival before retreating into thick cloud to be replaced by a heavy downpour of rain. It doesn’t matter, nothing can dampen our spirits. We check into the Pousada and head out for a beer. 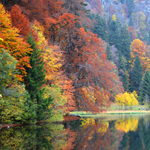 Reflecting on our experiences, I ask myself if I’ve discovered more about who I am, my weaknesses and strengths, and I conclude that I have not. Nor have I made any life-changing decisions or seen any aspect of my life in a whole new light. But I feel emotionally, mentally and physically refreshed by the experience. Even on my small taster I’ve met some amazing people, enjoyed some beautiful Galician countryside and been a small part of something far bigger than I imagined it was going to be, something that we resolve to undertake in full in the future. 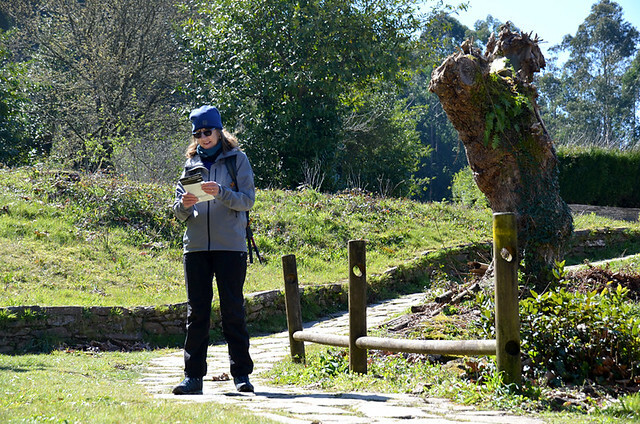 I have no doubt that when I walk the entire Camino Primitivo I will indeed uncover insights into myself and in all likelihood, come to some potentially life-changing conclusions, even if they only change small things. Sometimes the little things can make a big difference. 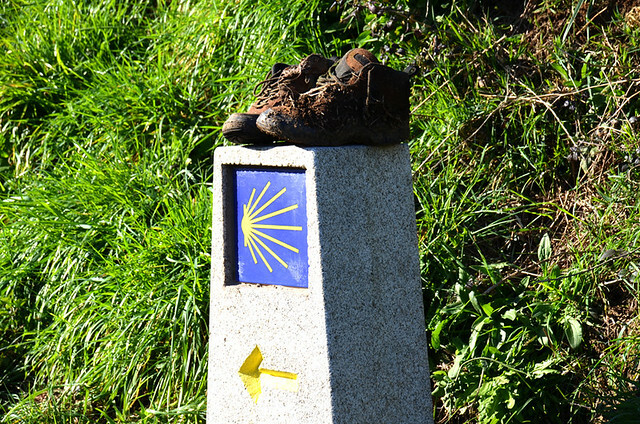 We walked a section of the Camino Santiago as guests of Gore-Tex, those clever people who produce the waterproof, windproof, breathable material which we find in all our favourite active brands and I’ll be sharing my experience of wearing those boots and that jacket on here in the coming weeks.